Today I had the pleasure of cooking for my work family. I believe if you’re going to call a mandatory meeting during the lunch hour, at minimum provide them a lunch made with love. And so we did. We had an Antipasto tray, Mexican Chicken Soup, Tomato Bread Salad, Caprese Salad, Melon Carpaccio, and Blueberry & Mango Quinoa Salad with Lemony Basil Vinaigrette adapted from Veggie Belly. We had planned to have fresh baked cookies for dessert. Leftover lunch turned into 3 o’clock break snacks and cookies were declared ‘tomorrow’s’ treat. We added fresh blueberries, ripe mango, cubed cucumbers, and dried cranberries to our salad. You could change it up adding strawberries or pineapple or even fine diced jalapeno. This dish is so summery light and delicious. One of my co-workers said it best…this could be dessert. 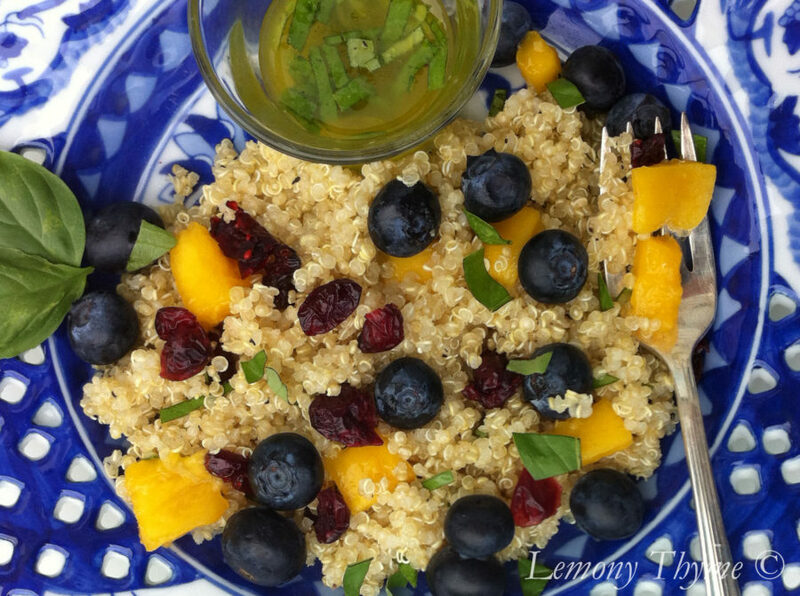 The fresh herbs add just the right depth of flavor and the lemon combined with the fruit sweetness gives the salad a beautiful tart finish. 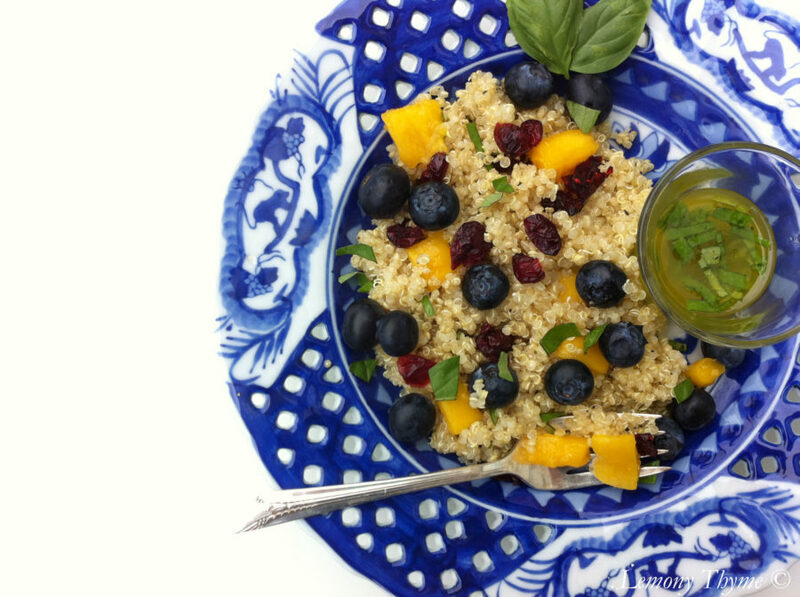 It was a hit, even for those of us who said “Quin-WHAT?” And check out all the amazing health benefits quinoa has to offer….just a little bonus! This salad is so light and delicious. Change up fruits and veggies as you like. Combine quinoa and water in a medium saucepan and bring to a boil. Reduce heat, and simmer covered for about 15 minutes or until the quinoa is cooked. Remove the lid, and fluff the quinoa with a fork and season with salt & pepper. Cut mango & cucumber into small cubes and combine with blueberries and cranberries. Just before serving, whisk together the lemon juice, olive oil, chopped lemony thyme and basil. 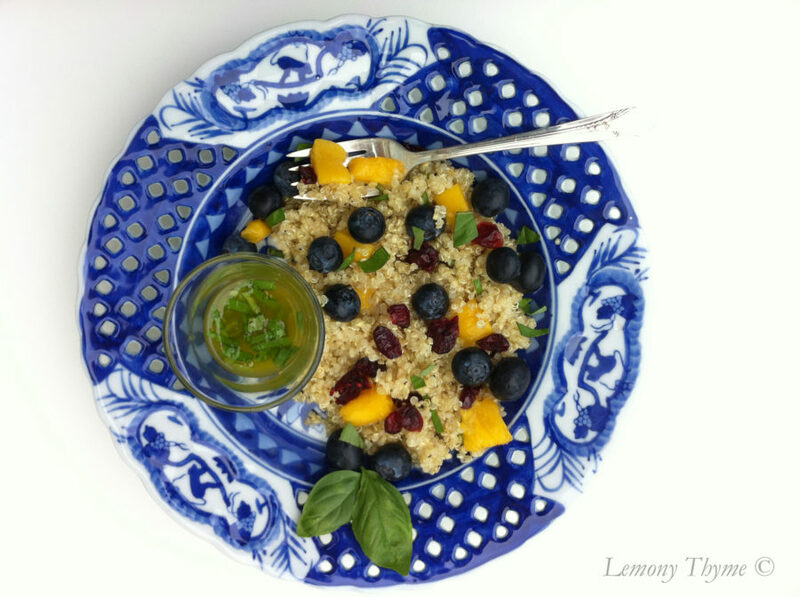 Toss quinoa with fruits and lemon vinaigrette, sprinkle with salt & pepper. Those sound like fabulous adds Nicole. I love mint with basil. Glad they enjoyed it!! And I agree wholeheartedly that ‘Love’ is an essential ingredient in every dish. Loved, loved, loved this dish. And I felt so good about going back for seconds!! You called it right…dessert without guilt! !